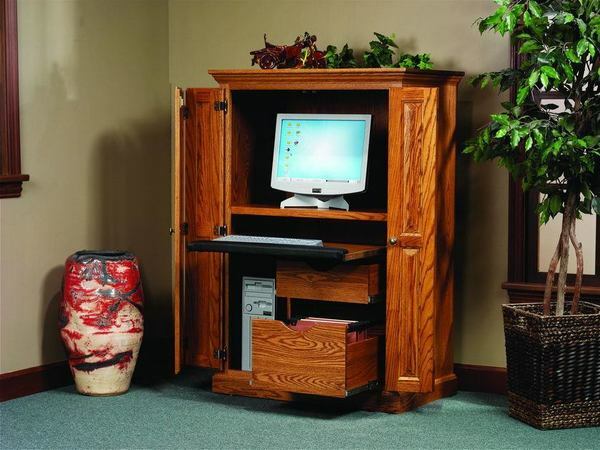 The Heirwood Computer Armoire Desk is a great way to hide a fully functional work station in any room of your house. The large bi-folding doors allow your computer and office supplies to be concealed when not in use so that your work station looks like a standard cabinet sitting against a wall. when you are ready to go to work, simply open the solid wood bi-folding doors and you are good to go. Give one of our friendly furniture specialists a call for additional information on this unique and useful Heirwood Computer Armoire Desk.